Golf lifestyle brand Greg Norman Collection, a leading worldwide marketer of technical golf wear for men and women, today announces that Alex Smith, PGA, has been named its 2018 Salesperson of the Year. 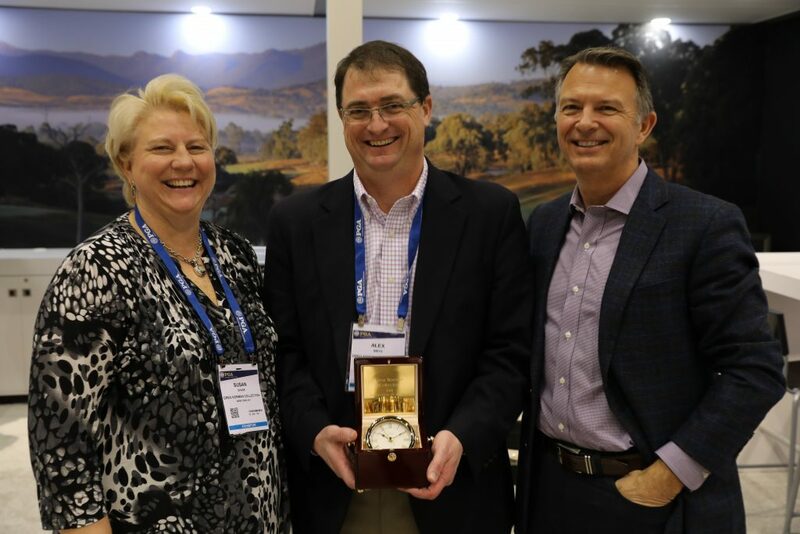 Smith, who currently manages company accounts in Upstate New York, was awarded the honor at the company’s Summer/Fall 2019 sales meeting in Orlando, Florida. Now in his second year with the brand, Smith was previously honored with the sales team’s Rookie of the Year award for 2017. “It is particularly rewarding to recognize Alex Smith as the 2018 Greg Norman Collection’s Salesperson of the Year given his PGA status and our longstanding support of the PGA of America and the great game of golf,” said Mike Elliott, President of Sales, Golf. Greg Norman Collection also recognized fellow PGA Professionals at the event as Paul Steward, PGA, who manages sales for non-coastal Georgia, Alabama and the Florida Panhandle, was awarded as the sales force’s 2018 Rookie of the Year and Turner Batdorf, PGA, Senior Sales Associate, earned the company’s 2018 Star Partner of Customer Service. Built upon a unique combination of performance, luxury and style, Greg Norman Collection is a leading worldwide marketer of golf-inspired apparel for men and women. Established in 1992, Greg Norman Collection is inspired by one of the world’s leading golf professionals, the man they call “The Shark.” Reflecting his adventurous spirit and confident, independent style, the Collection captures Greg Norman’s powerful elegance, enthusiasm and passion for an individual design sense.